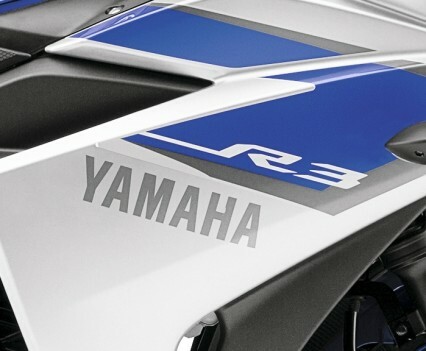 Yamaha may have been slightly delayed in joining the competition in the 300cc capacity but with the YZF-R3 they well and truly put their cards on the table with a winner. 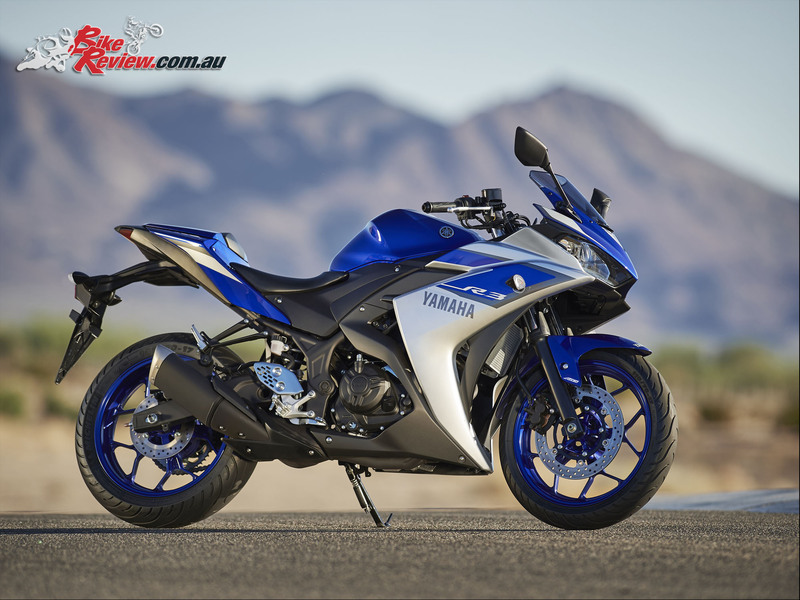 Styling is a mixture of the new R1 meeting the older R6 and as is the trend now, the bike would be easily mistaken for a larger machine. 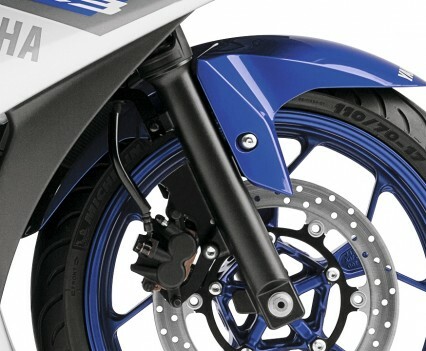 Wheels are a trendy light spoked design and forks aren’t the thin (diameter) items you’ll sometimes find on LAMS options, boding well for front-end performance, while wide mirrors, a taller screen and sporty colour schemes, on the blue and red options at least, really make the YZF-R3 stand out. 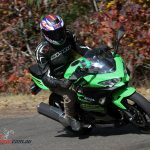 Jumping on the bike everything falls to hand, with a low seat height for my 180cm height and good reach to the bars and pegs. 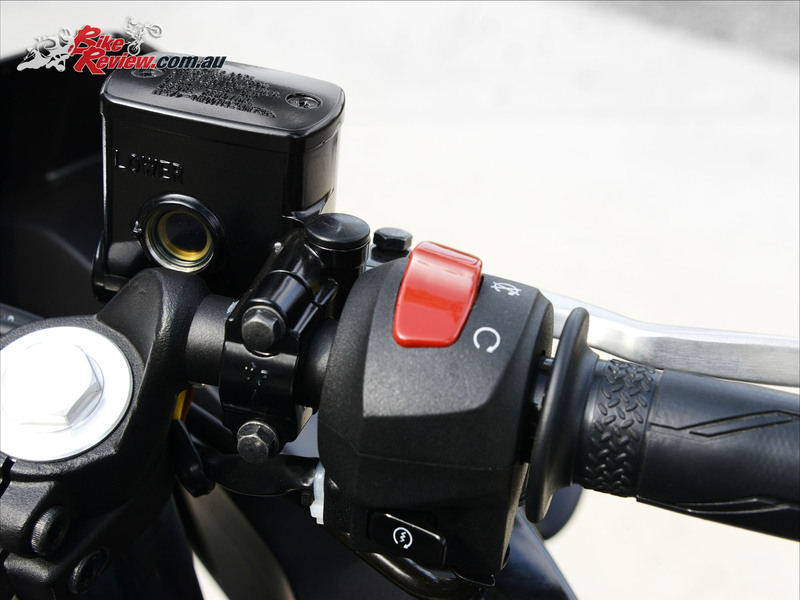 Controls are simple, with your starter, kill switch, indicators and high beams all easily used. 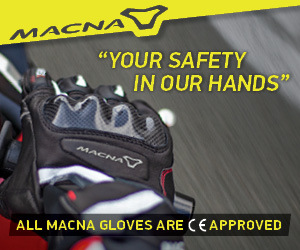 You’ve also got a ‘passing’ switch to flash your high beams. 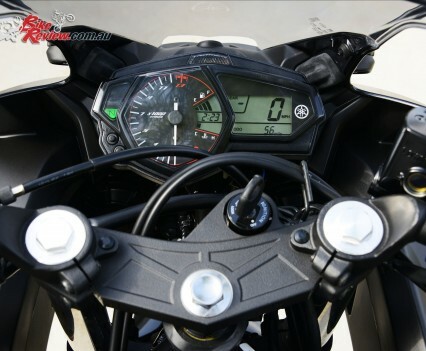 Levers aren’t adjustable, but the dash is top notch, with a few luxuries, like the gear indicator and shift light, something you still won’t find on some more expensive motorcycles. 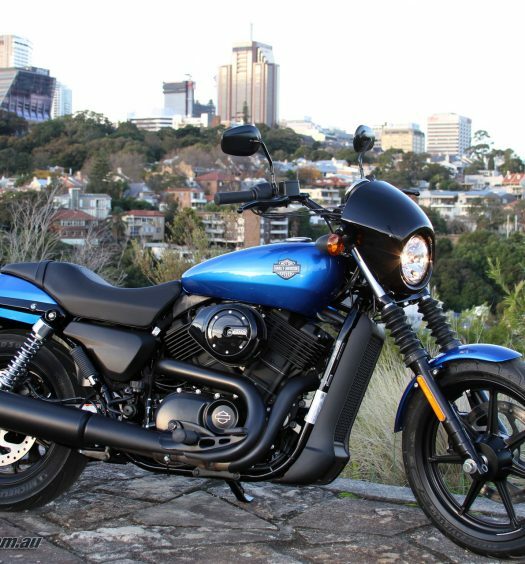 The paint can take a beating if you’re not careful, but for the price point it’s to be expected and with your regular wear and tear on a LAMS bike it won’t make a huge difference. 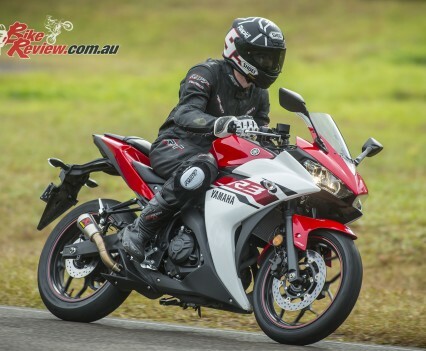 It is worth mentioning the R3 $6099 plus on roads, which to me seems very competitive and good value, putting them in direct competition with Kawasaki’s 300s, the KTM 390 models and realistically the Honda 500s. 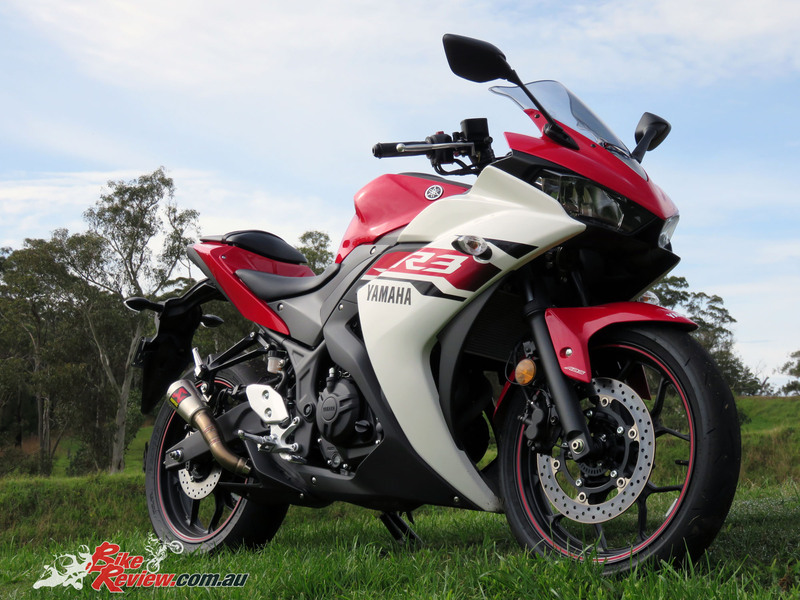 The YZF-R3 is comfortable and well proportioned and setting off into relatively light traffic in Western Sydney towards Cessnock the 321cc in-line twin-cylinder was pretty placid at first, and power comes on meek, but very controllable at low revs, making for ideal taking off and low speed control. 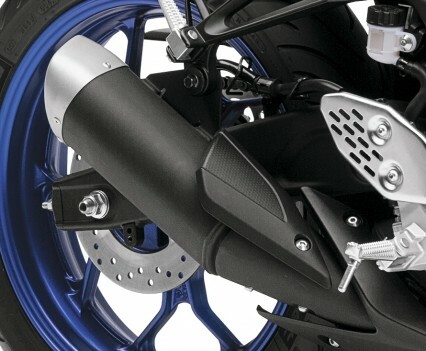 The clutch is light and easily balanced, while the front and rear brakes both provide good stopping power at low speeds. 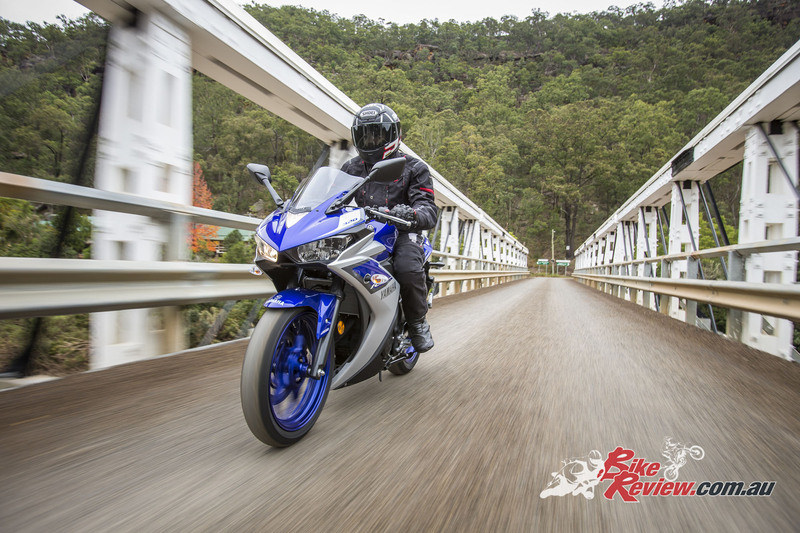 There’s good torque on hand for propelling you along, while the engine revs happily with less vibrations than its single cylinder competition and a larger and more interesting rev range. 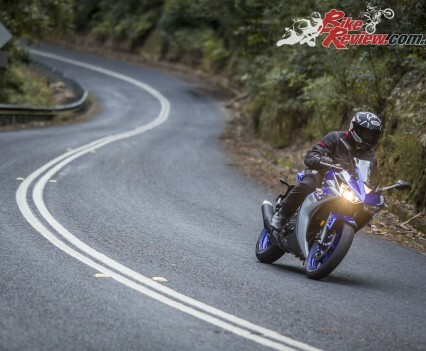 Powering through traffic is easy and you’re sure to be ahead of any cars if you filter to the front if you’re a bit more aggressive with the throttle. 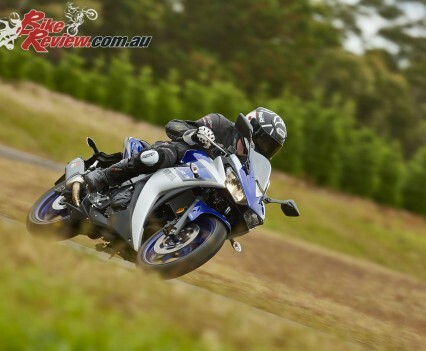 Handling is also super light and very agile, which isn’t something I normally notice so significantly coming from my usual ride – which ended up feeling a bit portly after a few days on the R3! 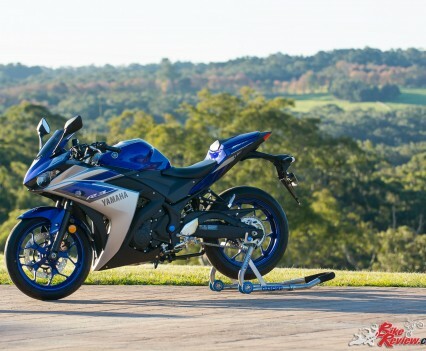 Another aspect of the YZF-R3 that really surprised me is that it’s not fitted with a slipper clutch, with the fueling set up to provide the same kind of experience, meaning in general traffic knocking down through the gears for a bit of engine braking was both fun and didn’t get the handling out of line. 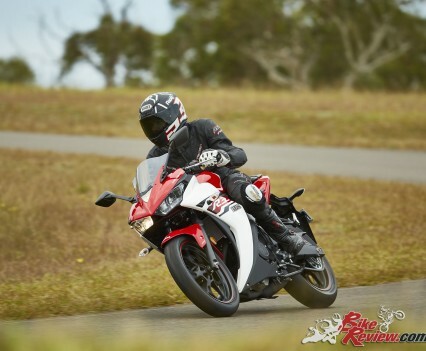 Heading onto the open roads however is where I was really able to appreciate the R3, with the ability to use the rev range a little more freely. 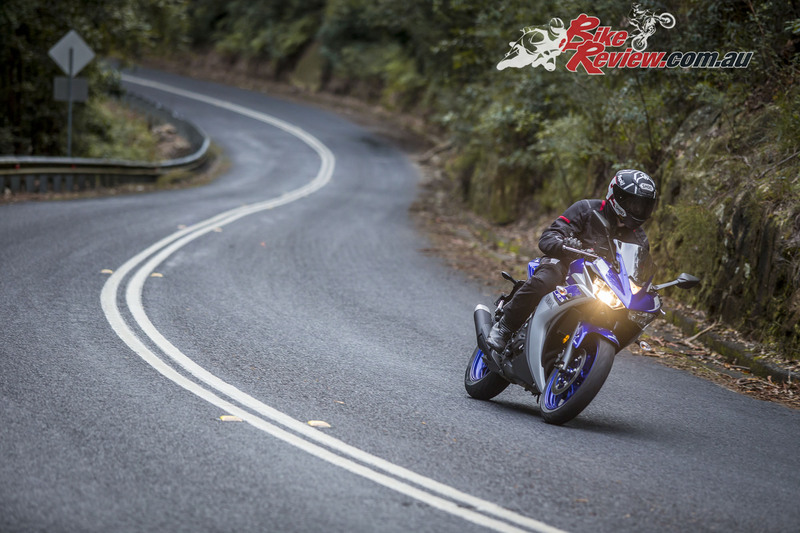 Where below 7000rpm the R3 is all manners and easy acceleration, above 7000rpm you really get into the meat of the powerband, with enough acceleration to really enjoy yourself and have some fun. 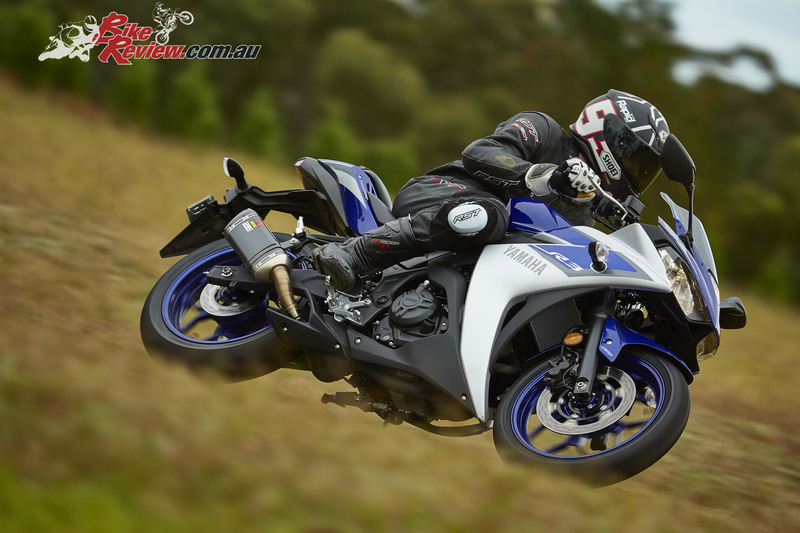 Plus if you’re hooning, aggressive throttle use from down low will net you a fast take-off thanks to the quick spinning engine. 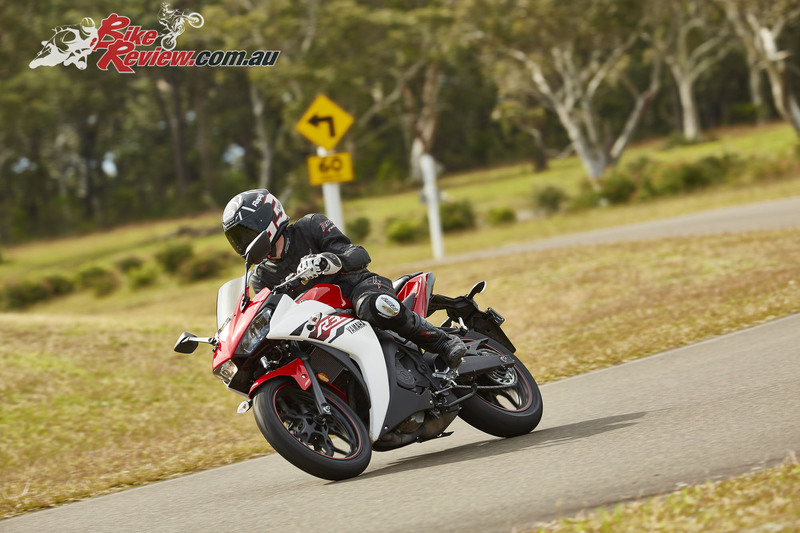 What’s also really impressive is that power doesn’t start dwindling off either, I wasn’t quite hitting the rev limiter but I was getting very close and the R3 was still powering along impressively, especially testing on a private road. 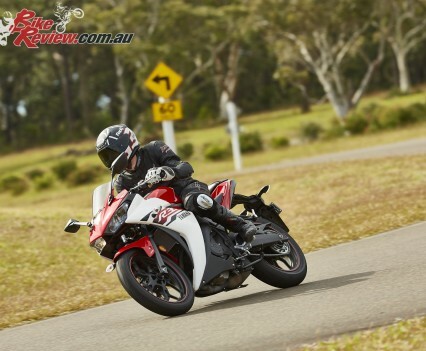 The engine is super willing to rev from 7000rpm through to 12500rpm, remaining smooth and not too loud, without the bike starting to feel like you’re pushing it too hard. 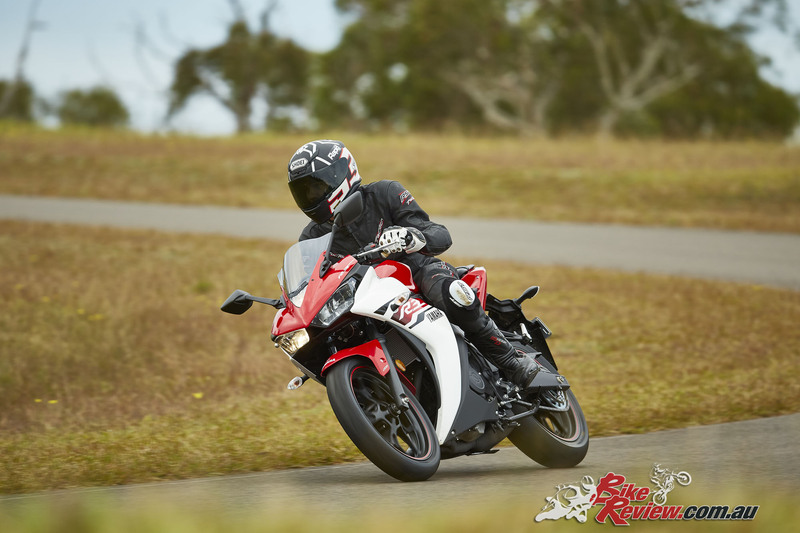 In reality the bike feels most at home right up high in the rev range even sitting between 11000 and 12000rpm. 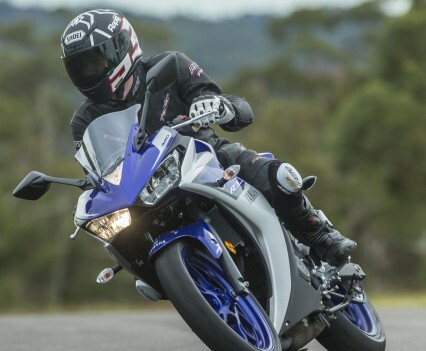 There’s no resistance felt through the throttle for the acceleration and fueling provides a very smooth and linear power buildup, which is perfect for good control and for less experienced riders. 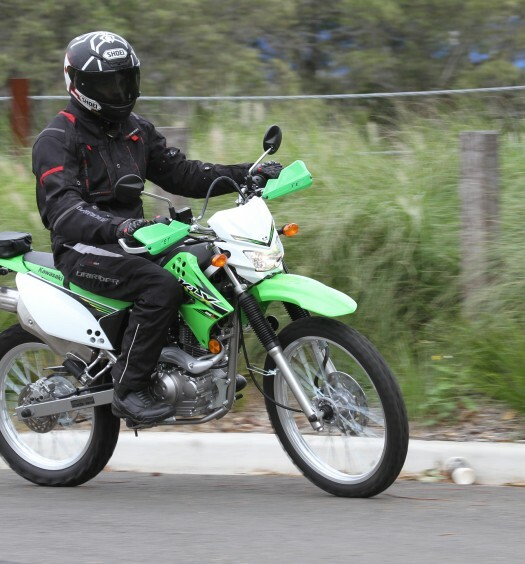 For the road riding, which was mainly in dry conditions except for some very light drizzle I couldn’t fault the stock Pilot Street tyres, even pushing the envelope a bit. 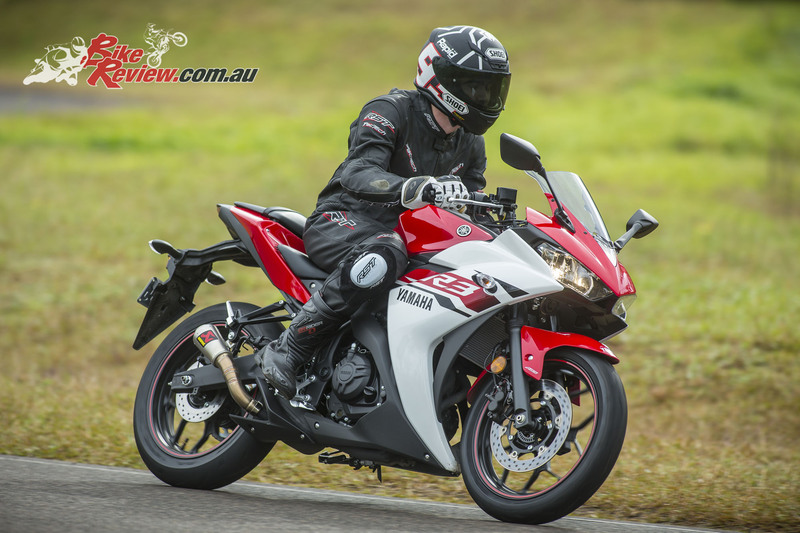 The other real standout for the R3 was the suspension, and forks are 41mm items, doing a bit of one-up-man-ship over most of the competition, not just in diameter but also in performance, while the rear shock offers preload adjustability, which can help for minor adjustments, like to stiffen up the rear. 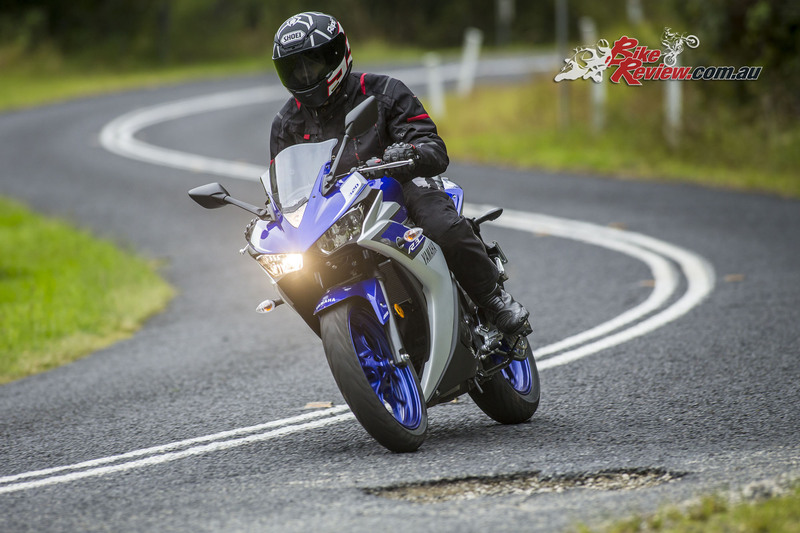 The stock suspension is well suited to a variety of rider weights, offering a smooth but sporty ride, especially on our often terrible road surfaces. 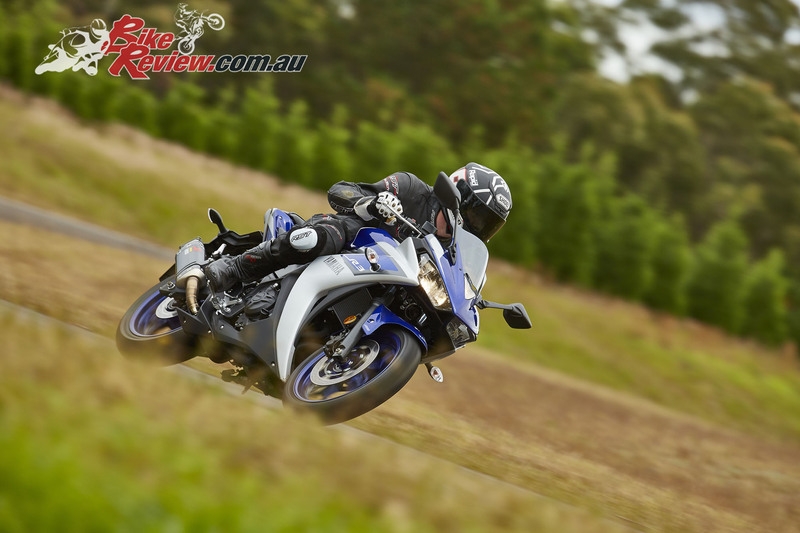 The chassis and suspension actually provided amazing feedback, even over the extremely rough sections we encountered up Wisemans Ferry way, with the ability to just ride through most of the poor surfaces. 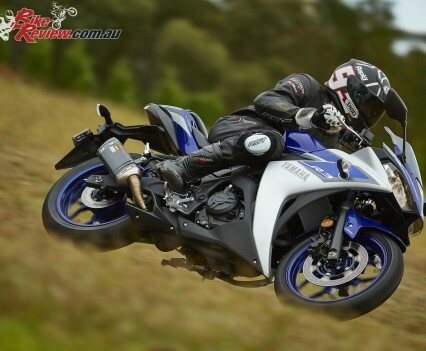 Keeping the throttle open, the bike balanced and committed and it would just take you over the road imperfections with the suspension swallowing the majority of roughness and leaving you with just a secure feeling of control and feel. 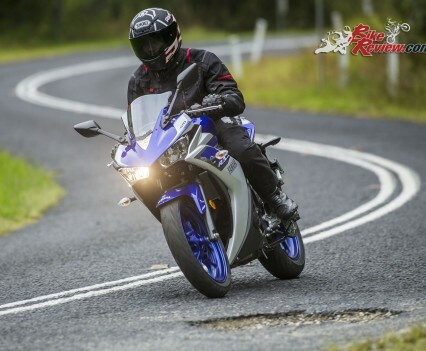 Braking was another strength, the single floating front rotor with two-piston caliper does a good job, with reasonable bite, easy modulation and great feel, plus ABS to provide that extra peace of mind. 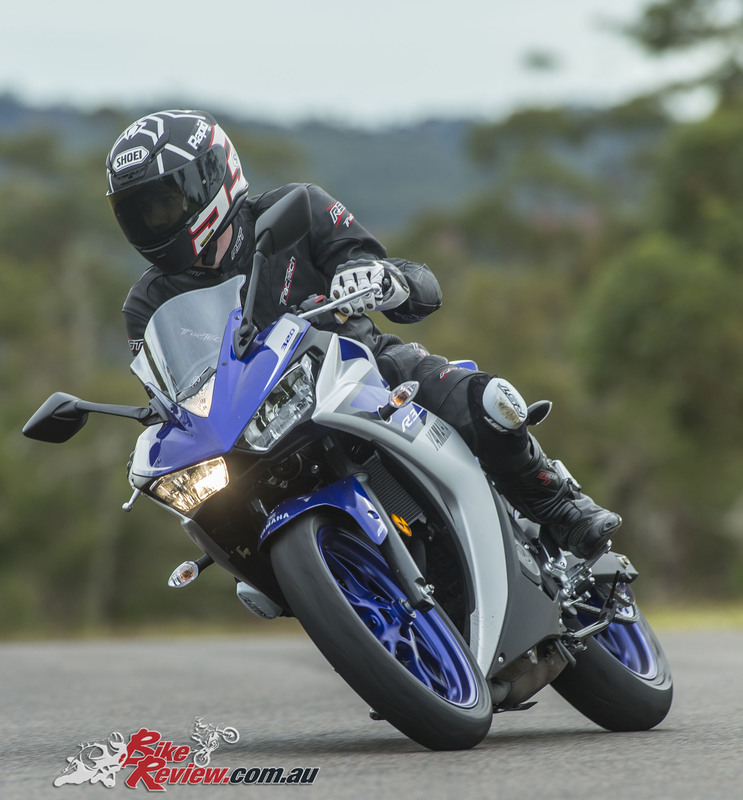 The rear is a single piston item, grasping a smaller 220mm rotor and I’ll admit to trying to get the ABS on the rear working over a few sections, including over some light gravel where we did tracking shots and couldn’t even get a twitch out of the ABS. 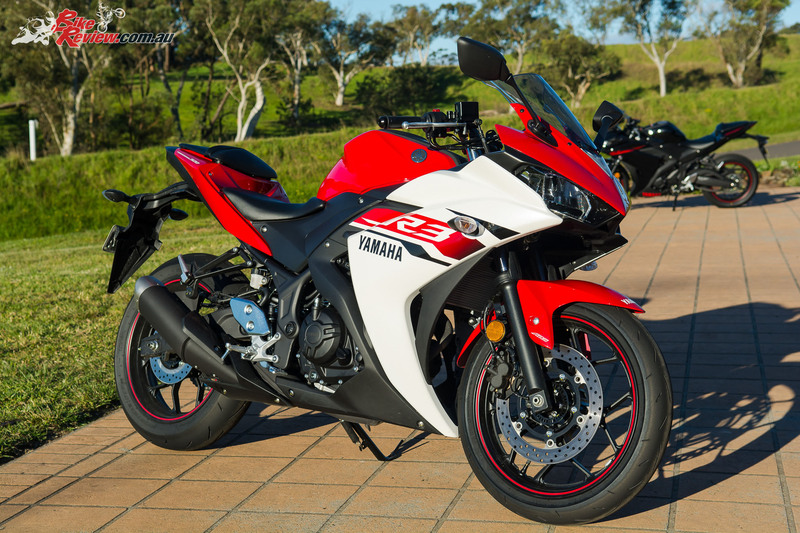 Overall the R3 really impressed me, the engine, chassis, suspension and looks are ticking all the boxes, with a great price and styling that any learner could be proud of. 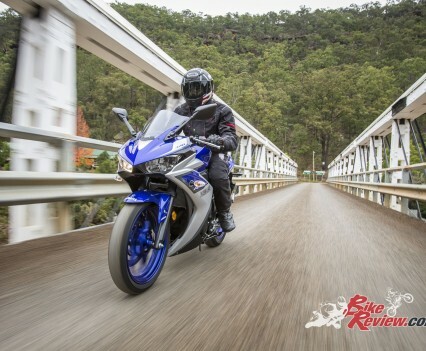 It’s big bike feel with great power and handling, while remaining controllable for both new and experienced riders, straight out of the box with no additional money spent. 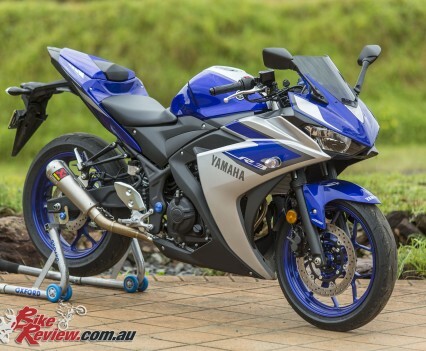 I would be hard pressed going past the Yamaha R3 if I were stuck on a LAMS bike for a few years and with Valentino Rossi’s seal of approval it’s hard to argue that this is an awesome little machine. 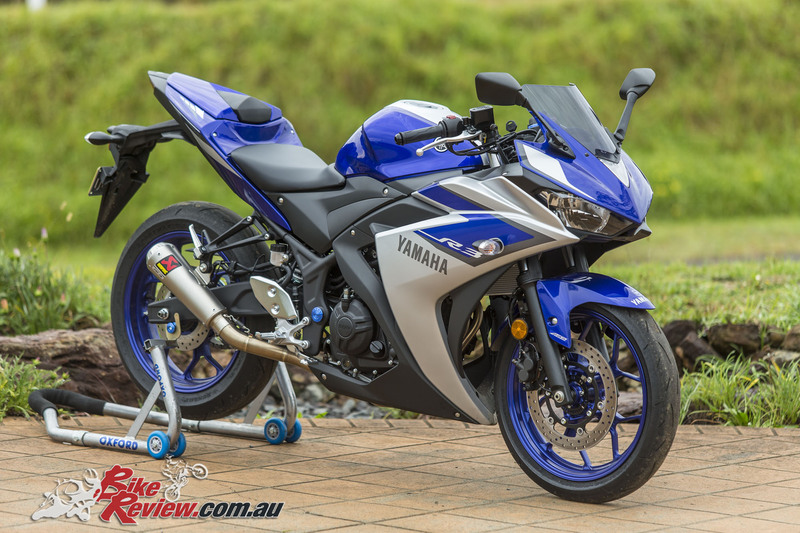 What really sets it apart for me is that I could buy one and do very little even if I was just working on my track riding, maybe some adjustable levers and I would be totally happy, although the carbon-fibre Akrapovic exhaust Yamaha have available would be a nice piece of kit too! 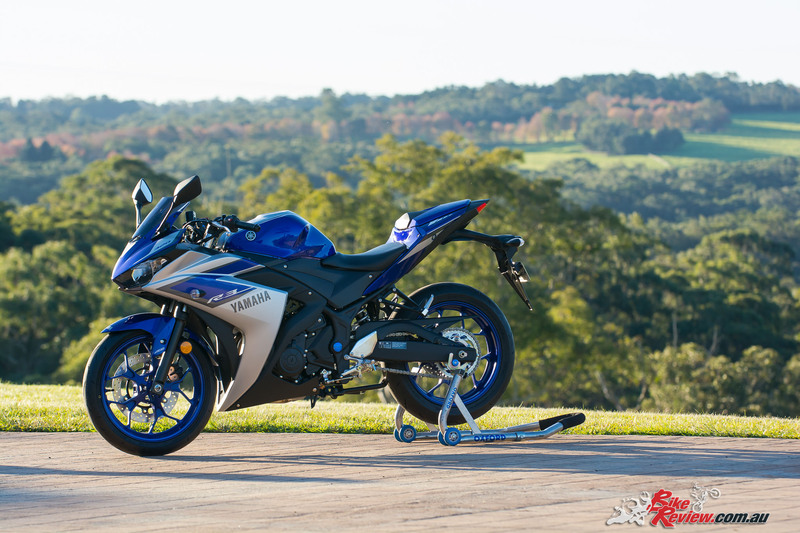 Powering the YZF-R3 is an all new 321cc inline-twin with an 180° crank for its easy revving nature, with DOHC and four-valves per cylinder. 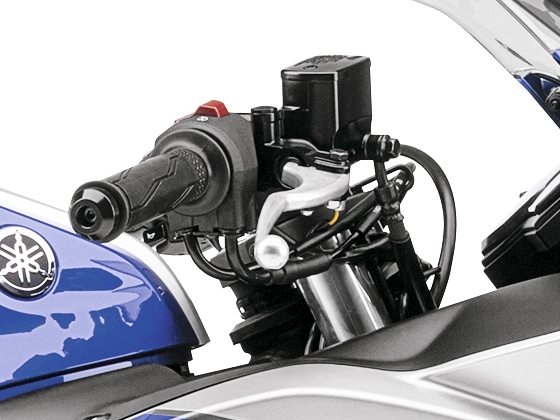 Power is an impressive 42hp at 10750rpm, with 29.6Nm of torque at 9000rpm, aided by compact multi-cone combustion chamber design and a downdraft throttlebody with narrow angle (12° IN and 12.75° EX) 26mm IN and 22.5mm EX valves. 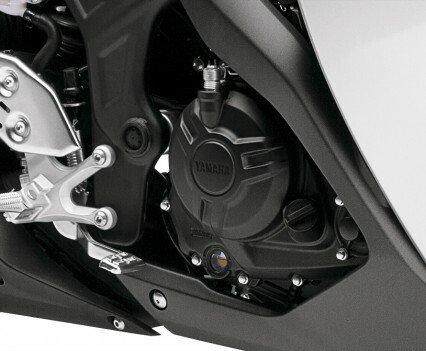 The twin uses an offset cylinder design, reducing frictional losses, with DiaSil cylinders – a first in a Yamaha twin, with the aluminium design including 20 per cent silicon for friction resistance and heat dissipation, while reducing weight. 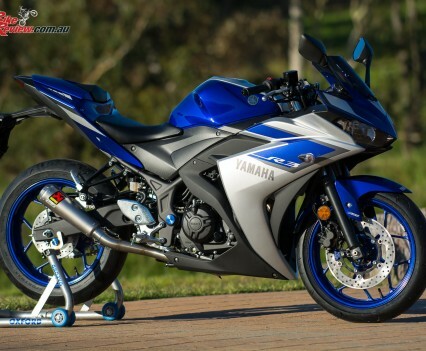 This also allows the use of low tension piston-rings to reduce horsepower losses. 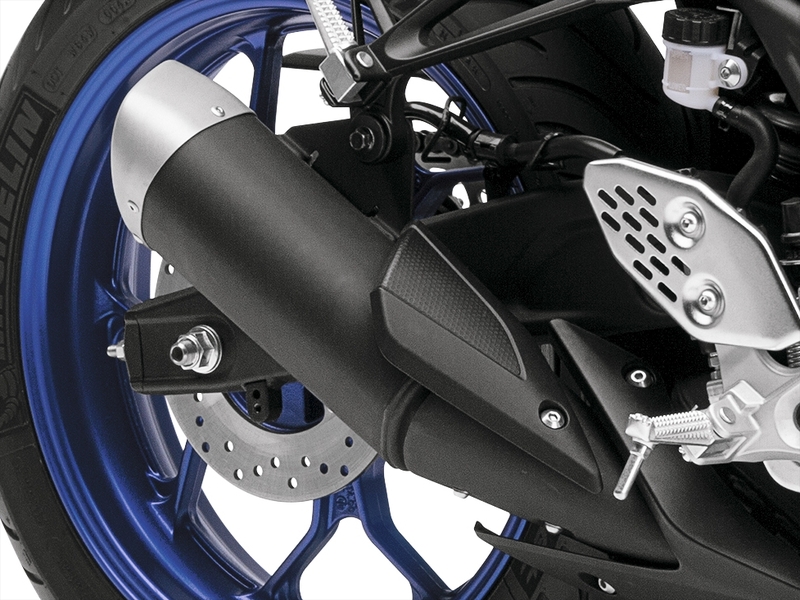 Forged aluminium pistons reduce weight, with lightweight rigid carburised con rods offering finer tolerances than standard rods. 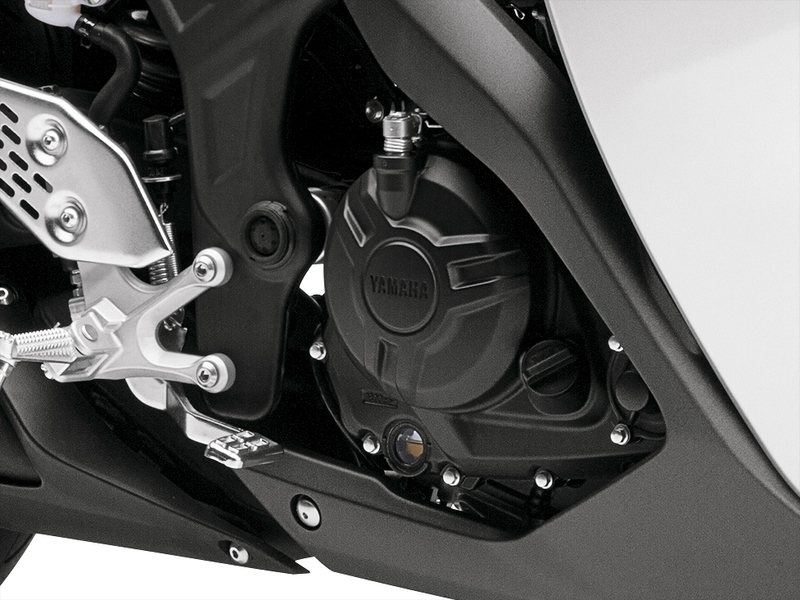 A lightweight primary balancer also does a great job throughout the rev range at reducing vibrations and engine noise, with the engine mounted by two front rubber mounts and three rigid mounts rear. Progressive throttle pulleys also do a great job in smoothing power delivery and ensuring control, giving a more carburetor like feel. 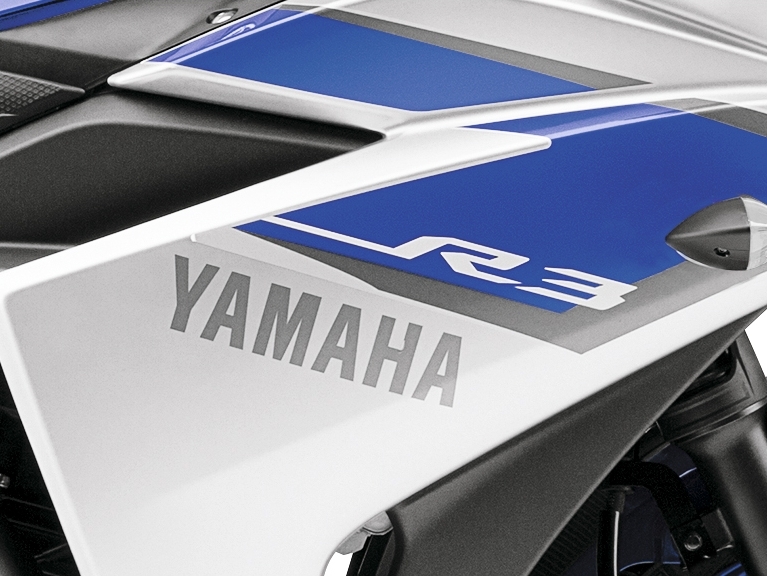 The Yamaha YZF-R3 uses a steel diamond-type frame, which is electro deposition coated to prevent corrosion, with a long pressed-steel asymmetric swingarm with hollow axle, following in the R1s footsteps and ensuring stable handling, sharing the R1’s swingarm to wheelbase ratio. 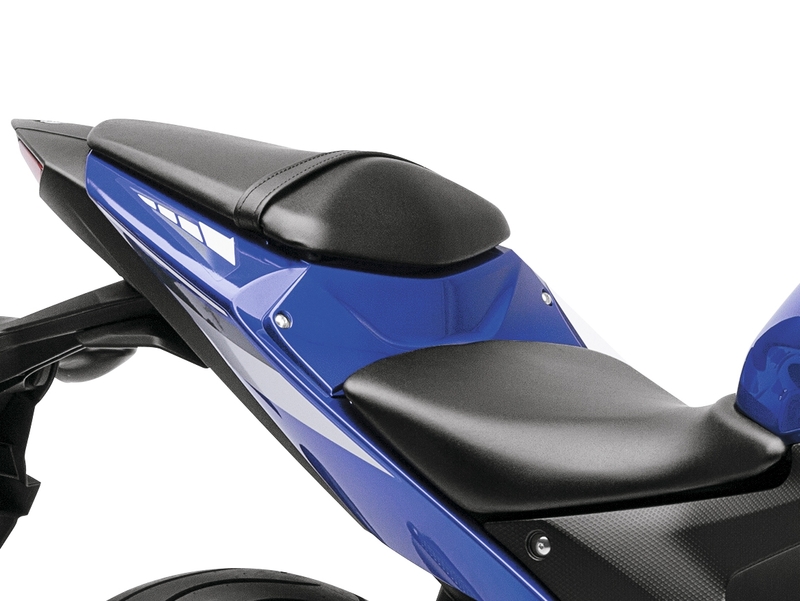 Suspension is 41mm forks, held by an aluminium handlebar crown and under bracket, with 130mm of travel and without adjustability. 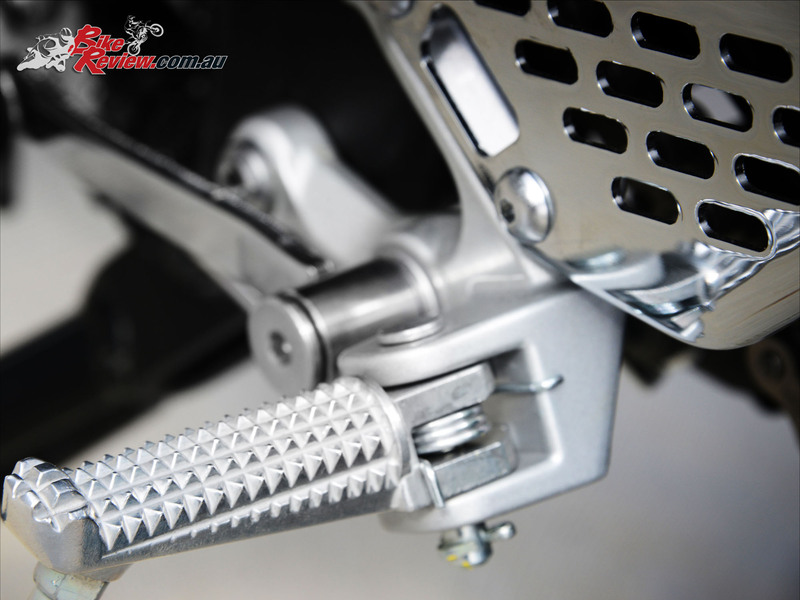 The rear Monocross shock offers 125mm of travel and is preload adjustable, as well as being mounted directly to the swingarm. 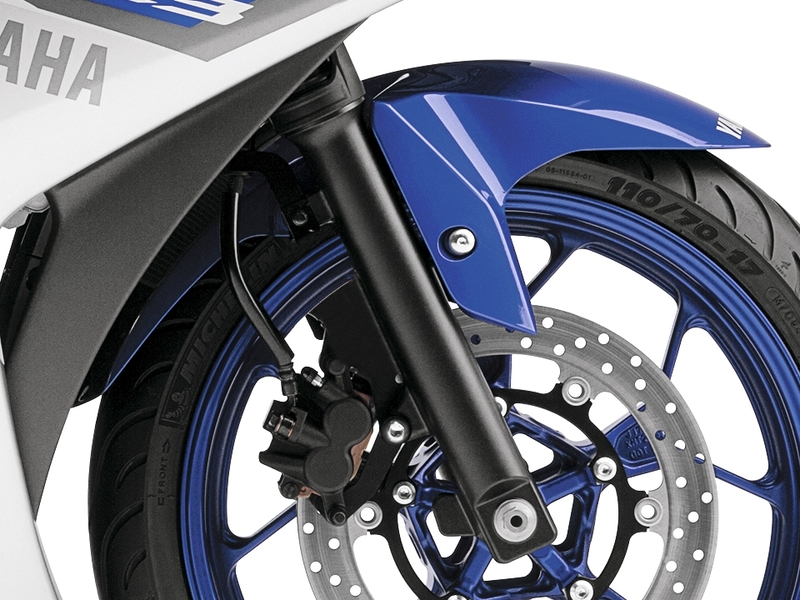 Wheels are 17in 10-spoke lightweight aluminium items with hollow hubs for further weight saving, with a 298mm front rotor and two-piston caliper, while the rear is a single-piston caliper grasping a 220mm rotor. 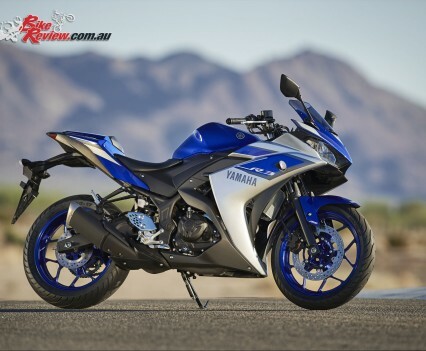 Weight distribution is also almost 50:50 front to rear, with a fully fueled curb weight of 169kg. 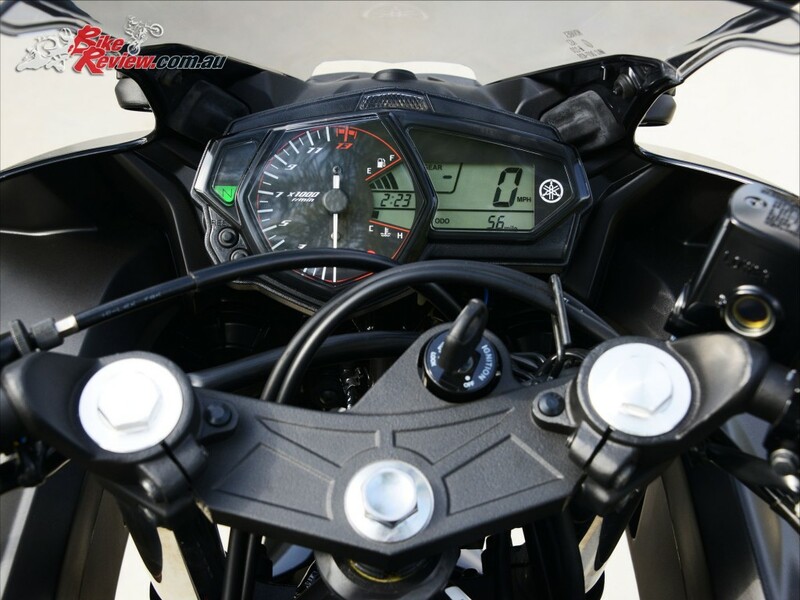 The Yamaha YZF-R3 comes standard with ABS, with the digital display providing a gear indicator, change light, oil change warning light, and ABS lamp, while the tachometer is analogue. 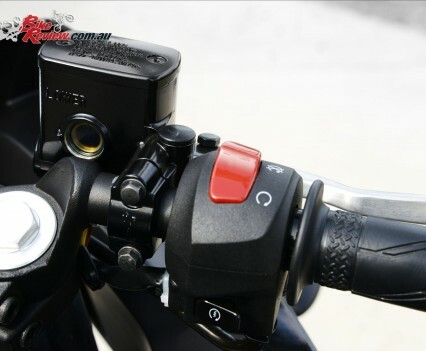 The taillight is an LED unit, with a low seat height of 780mm and the tank capacity is 14L. 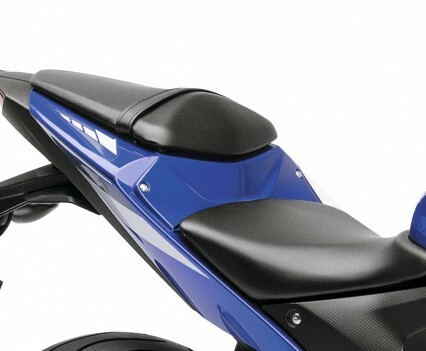 Available colours are blue, red and black, with a huge variety of accessories available, including slip-on exhausts, from Akrapovic, a seat cowl, frame sliders, a sportier screen, a rear seat bag that replaces the pillion seat, a rear carrier and top case, as well as LED indicators, and some billet goodies, such as a fork caps, stem cover, pivot cover set (frame plugs) and swingarm spools (pickups). 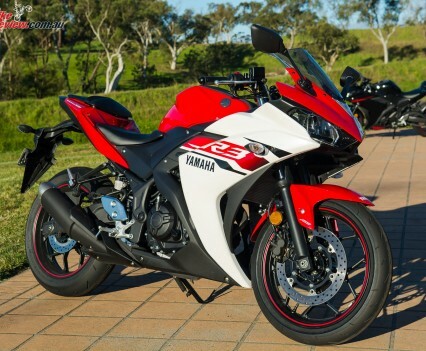 The YZF-R3 is marketed in Australia as being LAMS compliant. 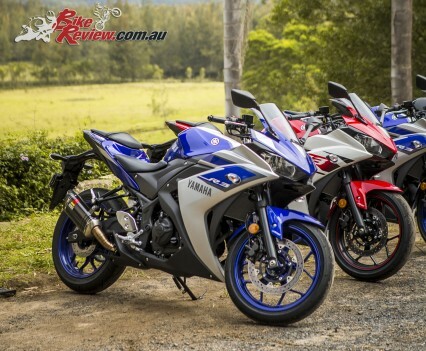 But the bikes in this review had after market exhaust / pipe on them. Hence, they would no longer be LAMS certified. 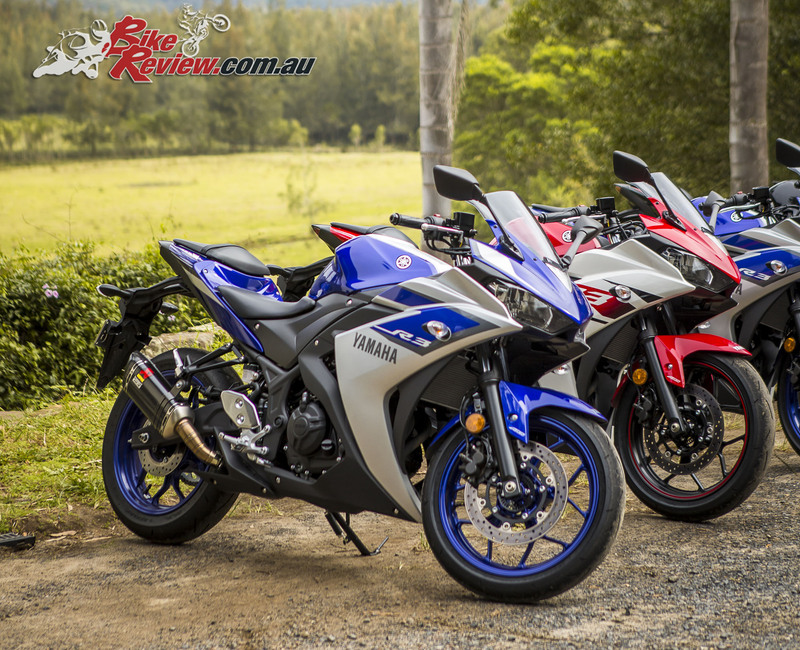 The test bikes at the launch included models with the non-standard exhausts available through Yamaha, from memory out of eight or ten machines, two had them – to give those present a point of comparison. 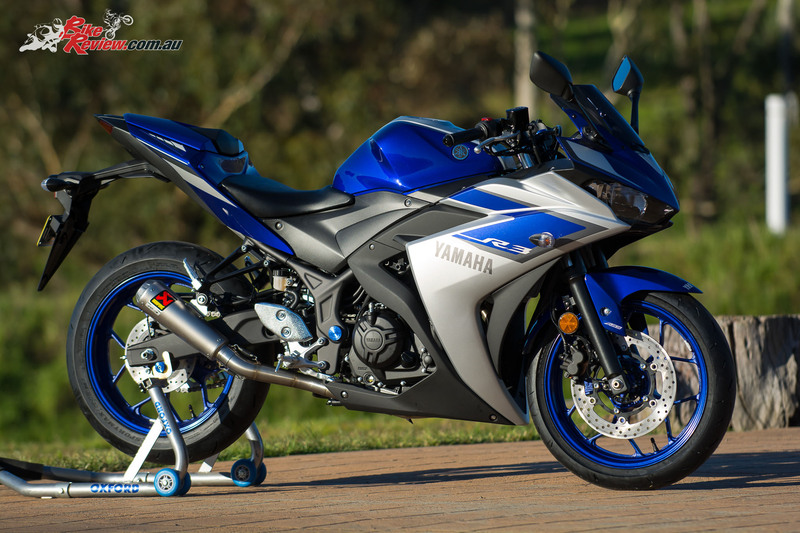 I tested those models at the track as you’ll see from the pictures. 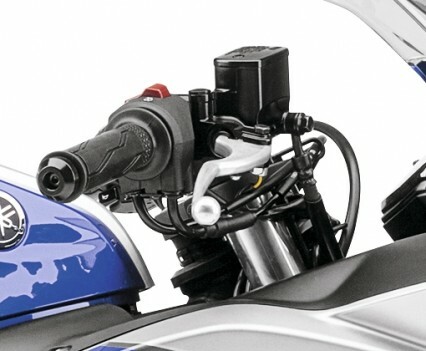 They would also only be non-LAMS legal if they exceed the power to weight ratio of the Learner Approved Motorcycle Scheme, although strictly speaking it’s best not to make modifications that effect power on a LAMS machine. 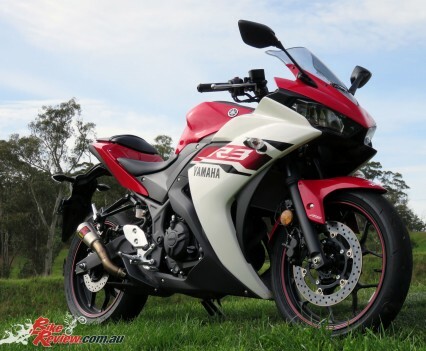 More realistically many LAMS riders will be doing so (as well as those not constricted by a restricted licence with one of these machines), and these are a much better option than many of the extremely cheap eBay specials available.